A rescue crew tests for the presence of poisonous carbon monoxide by lifting the caged bird close to the roof where the noxious but odorless gas accumulates. If the bird shows distress, immediate steps are taken to vacate and ventilate that section of the mine. Mechanical detectors also are widely used to show the presence of dangerous components in underground air. 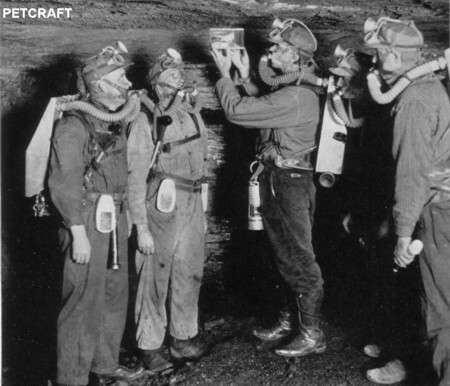 On their backs the men wear oxygen breathing apparatus. The canary, found today in every country on the globe, occupies a remarkable place, since among our common domestic birds it alone is kept and reared solely for the pleasure and companionship that it brings into our homes. As it does not produce flesh, feathers, or other product of commercial value, its contribution to our well-being comes entirely in the form of pleasing songs and interesting mannerisms. It joins cultivated flowers in making attractive the background for our lives. In a wild state the canary (Serinus canaria canaria) is native to three groups of islands in the eastern part of the Atlantic Ocean – the Canary Islands (from which it takes its name), Madeira, and the Azores. In the Canary group it is found on all of the islands except Fuerte-ventura and Lanzarote, and is one of the most common wild birds from sea level to the highest ridges. The true wild canary is grayish above, streaked rather heavily with blackish, and marked with yellow on the rump and crown. The breast is dull yellow and the sides grayish, indistinctly streaked. This is the stock from which all our domestic canaries have come. In many parts of the world there are other kinds of small yellowish birds known as “wild canaries,” but they have nothing to do with our domesticated bird. In the United States the name is given to such different species as the goldfinch (Spines tristis) and the yellow warbler (Dendroica aestiva), representatives of two distinct families. In Latin America the term “canario” is applied to many kinds of small tanagers, warblers, and sparrows. How the canary came into captivity is not recorded at this late day. Seemingly this must have been because of pleasing song, since the coloration of the wild canary is nothing remarkable. Sailors brought captive canaries home from voyages, demand arose for them, and from the end of the 15th into the 16th century Spaniards imported the wild-taken birds into Europe in numbers, selling them for good prices. Even at this early time it was found that canaries could be reared in captivity. And at the beginning of the 16th century the area where they were extensively produced spread from northern Italy north to center around Innsbruck, Nurnberg, and Augsburg. Turner in 1544 is the earliest writer known to me to mention the canary. Conrad Gesner, in the third book of his Historia Animalium, published in 1555, said that he had not seen one, but gave an account of the species from information furnished him by a friend in Augsburg. Canaries remained rare for a considerable period, and commanded such prices that for a long time they were kept only by the wealthy. Accustomed as we are to the canary in captivity, it seems strange to consider them as living wholly at freedom. In their island homes they range commonly in gardens and orchards, and are also found in flocks in sterile, stony country where they may be tame and confiding, or wild and difficult to approach. The nests are cups of grasses and weed stems lined with softer materials, placed in bushes or on low branches of trees. The three to five eggs are light green, spotted with reddish brown. The song is as attractive as in captive birds, though not so prolonged in utterance, nor is it given for so much of the year. Under domestication, variation among canaries began at an early date. Dr. E. Stresemann has pointed out figures of canaries with white wings and much yellow on the body in paintings by Lazarus Roting of Nurnberg, who died in 1614, so that the change from the original color to the yellow phase apparently was under way at the close of the 16th century. The yellow and the green types of canary, with every possible intergradation between, remain the common forms to the present. While the green canary is an approach to the parent stock, native birds from the Canary Islands are grayer on the back than most of those found in captivity. The ordinary household canary, kept by those who merely love birds, is of moderate size, with the colors as indicated above. It will be of interest to examine some of the distinct strains kept mainly by canary fanciers, who breed pure stock and retain only those birds with the definite characters of the variety concerned.